Ryan Stewart, a speech-language pathologist (SLP) in Virginia, developed a strange set of symptoms in 2009 that baffled one doctor after another. Included among those symptoms were a racing heartbeat following minimal physical exertion, heart palpitations, shortness of breath, and chest pain. “It felt like an elephant was sitting on my chest,” she explains. Over the next 10 years, Stewart’s symptoms waxed and waned. Some days, they would let up; other days, a sudden episode of rapid heartbeats or dizziness would frighten her — sending her to the emergency room or an urgent care clinic. Unfortunately, she always left those healthcare facilities without answers. Though Stewart believed her symptoms stemmed from her heart, repeated electrocardiograms (EKG), a cardiac MRI, and a couple week-long stints of wearing heart monitors all came back as normal. “They could never catch a cardiac episode,” she says. Determined to live a normal life, Stewart continued her work as an SLP and began planning a family with her husband. After a series of fertility treatments, she became pregnant only to suffer a miscarriage in the early weeks — a devastating loss, she says. Shortly after the miscarriage, a new group of debilitating symptoms emerged, which included crushing fatigue, heaviness and weakness throughout her whole body, postural orthostatic tachycardia syndrome (POTS), numbness, and tingling. By now, it was 2013, and at the recommendation of a family friend, Stewart rallied the strength to see another doctor — a Lyme-literate one, though she didn’t realize it at the time. This appointment, however, was different than the previous ones, and she received some surprising, but much-needed news: Stewart had Lyme disease, along with Babesia, Bartonella, and a high Epstein-Barr viral load. “Lyme wasn’t even on my radar!” she recalls. Simply having these diagnoses was a relief, but it wasn’t enough to solve the issues affecting her cardiovascular system. Stewart likens the feeling she experienced in her chest to a switchboard in which electrical lights pop up in many different directions, one right after the other. Since then, Stewart has tried numerous ways to address her symptoms. Her current treatment involves using beta blockers; she tried antiarrhythmic drugs, but the side effects were intolerable. 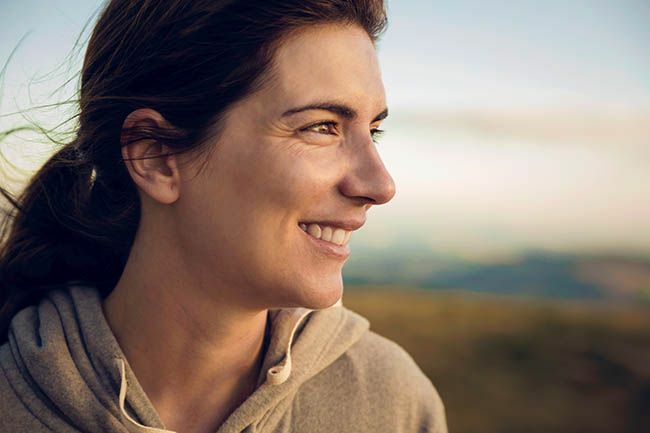 She’s currently pursuing treatment for Lyme disease, too, and she’s investigating herbal therapies, stress reduction, and other lifestyle modifications in the hopes of improving her overall health. Stewart’s story highlights some of the signs and symptoms associated with Lyme disease and the cardiovascular manifestations of the illness. To date, there’s no absolute consensus on the prevalence of cardiac involvement in people with Lyme disease. But new research suggests heart symptoms may be present in 0.4% to 10% of Lyme disease cases, according to a 2019 study in the Journal of the American College of Cardiology. To understand what happens to a heart impacted by Lyme, it helps to first know how a healthy heart functions. In a healthy person, the heart pumps blood like a well-oiled machine, which delivers critical nutrients and oxygen to every cell, tissue, and organ in the body, and it removes carbon dioxide and other waste products from those tissues. Blood flows in the same direction throughout the body — arteries carry oxygenated blood away from your heart, and veins return oxygen-poor blood back to the heart. It consists of four chambers, including two atria and two ventricles. There are two atria, known as the right and left atrium. The right atrium receives deoxygenated blood from a large vein called the vena cava; the left atrium receives deoxygenated blood from the lungs. The ventricles’ job is to collect and expel blood that comes from the atria. The right ventricle pumps deoxygenated blood into the vascular tree of the lungs where it receives oxygen. Then, the left ventricle pumps the oxygen-rich blood back to the tissues of the body. The upper wall of the right atrium houses a cluster of cells known as the sinoatrial node (SA node). The SA node is referred to as the “heart’s natural pacemaker,” because it produces the electrical activity that’s responsible for the rate and rhythm of your heartbeat. Your heart and your circulatory system, which contain a vast network of blood vessels that circulate blood through your body and return it to the heart, function as one unit known as the cardiovascular system. The cardiovascular system has such an expansive network of blood vessels that if they were laid out from end to end, they would cover roughly 60,000 miles — that’s enough to go around the globe more than two times. Like many other Lyme experts and patients, Dr. Bill Rawls, Medical Director of Vital Plan, believes many more than one in 10 people with Lyme disease may have some degree of heart issues. The symptomatology can vary from person to person, and exist on a spectrum of mild to severe. The likely bacterial and viral culprits causing cardiovascular symptoms include Borrelia (the primary bacteria implicated in Lyme), Bartonella, Mycoplasma, cytomegalovirus (CMV), and probably many others. These stealth microbes enter the body and spread throughout the tissues by various mechanisms. They have one goal: Survival, notes Dr. Rawls. And they migrate or set up camp anywhere they can in the body, including the heart. When stealth pathogens thrive, they can alter the electrical signaling to the heart, affecting the heartbeat or causing irritation to the heart itself. The result: The heart beats irregularly, and the contraction becomes less efficient at pumping blood. Additionally, an abnormal heart rate isn’t the only way microbes can affect the heart. As the pathogens disseminate throughout the organ and further irritate the heart muscle, the heart can become oxygen-deprived, leading to angina (chest pain), heart attack, shortness of breath, and more. For most people with Lyme disease and other chronic illnesses like fibromyalgia and chronic fatigue syndrome, we become accustomed to symptoms that fluctuate from one day to the next. We’re so used to it, in fact, that we often adopt a wait-and-see approach to the newest symptom du jour. 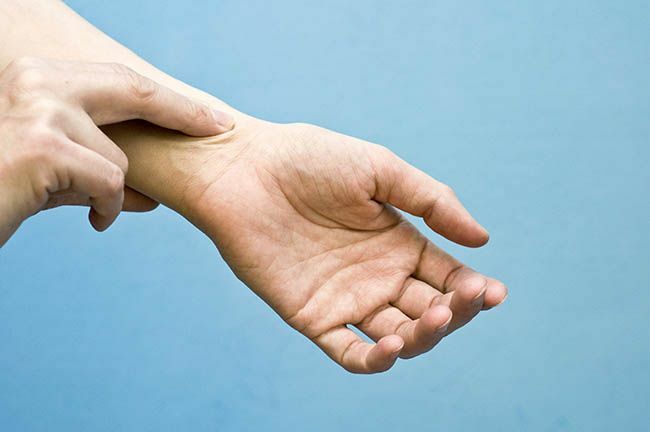 But there are times when our bodies give us warning signs — red-flag symptoms that we should get checked out as soon as possible, even if going to the doctor seems uneventful or inconvenient. The primary symptoms to seek medical attention for include irregular heartbeats that aren’t going away, persistent chest pain, or shortness of breath associated with exertion, says Dr. Rawls. Let’s look at three conditions that can be caused when Lyme, coinfections, or other stealth pathogens affect the heart, including the most well-known one called Lyme carditis. Most people with Lyme are aware that Lyme carditis (LC), which causes inflammation in the heart, is the most serious cardiac manifestation of Lyme disease. Symptoms may develop and progress rapidly, even as quickly as one week after the bite of an infected tick. No parts of the heart are off limits to these insidious microbes. They can affect the heart’s muscle tissues (myocardium), the membrane that encases the heart (pericardium), the tissues that line its chambers (endocardium), the valves, the aorta, and sometimes a combination of the different parts of the heart. 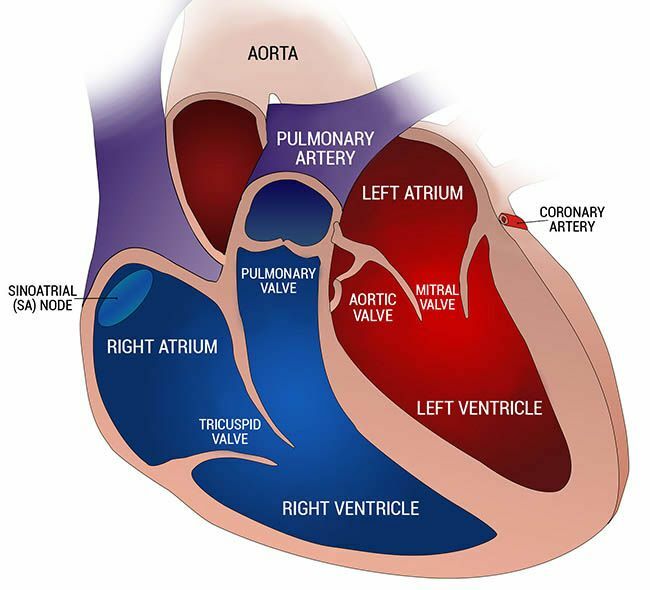 An inflamed heart impacts the way the SA node operates the heart’s electrical system. It tends to slow the heart down due to a condition known as a heart block, or atrioventricular block (AV block), which varies in severity from first-degree to third-degree. In first-degree heart block, the electrical impulses reach the ventricles — the bottom chambers of the heart — at a slower than normal pace. The condition can progress to a second-degree heart block, where the heart produces electrical signals, but they only partially reach the ventricles. In some cases, they don’t reach it at all. In a third-degree or complete heart block, the electrical signals are completely obstructed from reaching the ventricles. One sign of complete heart block is a pulse of less than 60 that doesn’t increase with exertion, and intolerance to exertion. When the heart is unable to pump blood efficiently, it can’t provide the body with adequate, oxygenated blood. If caught early, a heart block can often be resolved with antibiotics and occasionally, the use of a temporary pacemaker to maintain the electrical activity of the heart. If not swiftly and adequately treated, the result could be the placement of a permanent pacemaker or sudden cardiac death (SCD). Generally, most cases of Lyme carditis occur during June through December, according to an article in the journal Circulation, and it seems to occur slightly more in males than in females. Additionally, LC is more likely to be found in individuals who fall into the age groups of 5 to 14 and 44 to 59 years of age. At the present time, researchers are unsure of whether an underlying cardiac condition poses an increased risk of developing LC compared to those in the general population who contract Lyme disease. A myocardial infarction (MI) is commonly known as a heart attack. It happens when a part of the heart is unable to receive oxygen due to a blockage in the coronary artery, which causes damage to the heart muscle. The journal, Infectious Disease Clinics of North America, lists it as another possible cardiac manifestation of Lyme disease. However, it’s difficult to know how common heart attacks are among Lyme patients, especially since many cases of the illness are misdiagnosed in both the acute and chronic stages of the disease. An abnormal heartbeat where the heart is beating too slowly, too rapidly, or irregularly is categorized as an arrhythmia. There are several types of arrhythmias. For instance, when the heart beats too slowly, it’s called bradycardia; when it beats too quickly, it’s referred to as tachycardia. Some arrhythmias may be benign or harmless. But others, such as the type experienced by Stewart, can bring about a distressing set of symptoms. 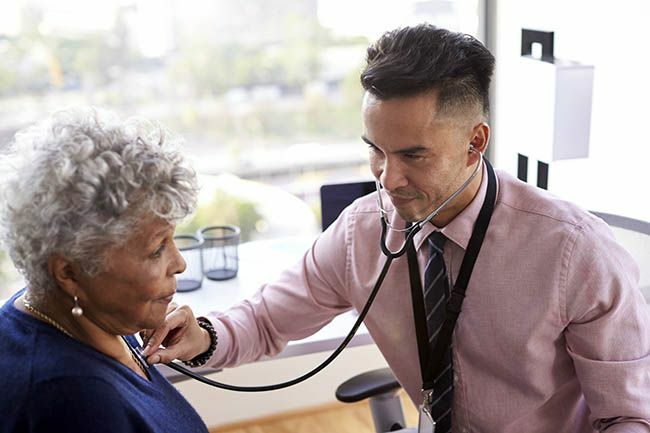 Because arrhythmias can have the potential to be life-threatening, you should be persistent about visiting your doctor and getting a proper diagnosis. When diagnosing Lyme-related cardiac conditions, there are a battery tests your doctor might want you to undergo, such as those that Stewart was required to do. Common testing methods may include blood work, an EKG, an echocardiogram, a cardiac MRI, wearing various heart monitors, and more. And, like Stewart’s case, testing doesn’t always capture problems on the first go-around, so it might take multiple efforts to get the right diagnosis. 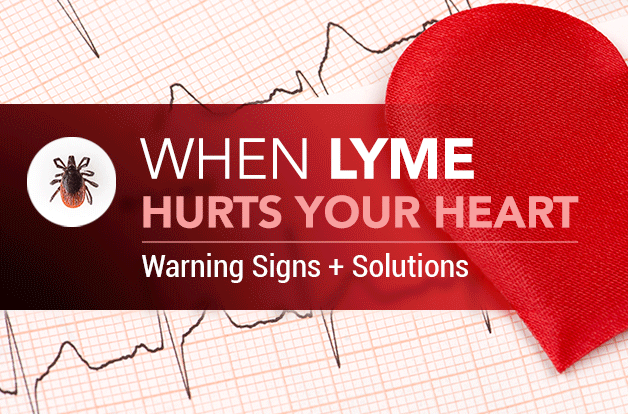 Could other conditions impact cardiac function as a result of Lyme disease, too? Probably: medical literature names coronary artery aneurysms, QT-interval prolongation, and congestive heart failure (CHF) among other reported heart manifestations. However, very few statistics, if any, exist regarding the prevalence of these conditions among Lyme patients. The medical community still has a lot to learn about the way Lyme disease, co-infections, and other microbes impact the heart. In other words, if your heart feels off — you’re experiencing chest pain, shortness of breath, an irregular heartbeat, or something else — get to a doctor as soon as possible. Once you know what you’re dealing with, you and your doctor can establish a plan of care, which may include antibiotics, particularly in the acute stages of Lyme disease. Other drug therapies include beta blockers and antiarrhythmic drugs, which might be necessary to stabilize your heart rate and prevent abnormal rhythms. However, those drugs can come with a long list of side effects, and the length of time you could be required to take them will differ from physician to physician and the severity of your illness. Some people may need to have a temporary pacemaker implanted into the heart to regulate heart rhythms. Additionally, another treatment you may hear mentioned is a catheter ablation for arrhythmias. This procedure destroys the abnormal cells in the heart that are misfiring. Fortunately, neither of these procedures are needed very often. It’s important to note that lifestyle modifications and herbal interventions can also play a critical role in managing cardiac symptoms and helping the heart heal. Because herbs have a normalizing effect on the body and a low chance of toxicity, they can be used in conjunction with many medication regimens. “Herbs may allow a person the ability to take less medication and reduce the side effects of drugs. I think it’s important for people to note that herbs are restorative to the body and support healing,” says Dr. Rawls. Why do some people have heart issues with Lyme disease and others don’t? Dr. Rawls postulates that some of us may have a genetic predisposition or a certain spectrum of microbes that, when combined with lifestyle factors like high stress levels, poor diet, a toxic environment, and inactivity, makes us more vulnerable to cardiovascular involvement. Great article on heart involvement with Lyme/MSIDS, which is far more common than acknowledged. https://madisonarealymesupportgroup.com/2018/02/22/new-lyme-cme-course-available-lyme-carditis-more-than-blocked-beats/ Course for doctors to become educated. LET’S SUFFICE IT TO SAY, HEART PROBLEMS WITH TICK BORNE ILLNESS IS NOT RARE. Chief Scientific Officer, Galaxy Diagnostics, Inc.
Bartonella species are fastidious gram-negative bacteria that are highly adapted to a mammalian reservoir host and within which the bacteria usually cause a long-lasting intraerythrocytic bacteremia. 1-3 These facts are of particular importance to veterinarians and physicians, as an increasing number of animal reservoir hosts have been identified for various Bartonella species. Among numerous other examples, Bartonella henselae has co-evolved with cats, Bartonella vinsonii subsp. berkhoffii has co-evolved with dogs and wild canines, and Bartonella bovid has co-evolved with cattle. 1-2 Importantly, the list of reservoir-adapted Bartonella species, including a large number of rodent species that might serve as “pocket pets,” continues to grow exponentially, as new Bartonella spp. are discovered. Prior to 1990, there were only two named Bartonella species, whereas there are now at least 24 named and numerous unnamed or candidatus species, based upon deposited Gen Bank sequences or preliminary reports, respectively, seventeen Bartonella spp. including B.alsatica, B. bacilliformis, B. clarridgeiae, B. doshiae, B. elizabethae, B. grahamii, B. henselae (Houston 1 and San Antonio 2 strains), B. koehlerae, B. melophagi, B. quintana, B. rochalimaea, B. tamiae, B. vinsonii subsp. berkhoffii (Genotypes I, II and III), and B. washoensis have been associated with an expanding spectrum of human diseases. Epidemiological evidence and experimental flea transmission studies support an important role for fleas in the transmission of B. henselae, B. clarridgeae and most likely B. koehlerae among cats. 1 Three other Bartonella species, B. bovid, B. quintana and B. vinsonii subsp. berkhoffii have been isolated from cat blood, but the modes of transmission and the reservoir potential of these species in felids has not been definitively established. Recently, we isolated Bartonella vinsonii subsp. berkhoffii from a cat with recurrent osteomyelitis spanning an eighteen month time period. 2 Thus, cats can maintain a chronic bacteremia with at least six Bartonella spp., of which five are known zoonotic pathogens. 1-3 In addition to fleas, an increasing number of arthropod vectors, including biting flies, keds, lice, sandflys and ticks have been implicated in the transmission of Bartonella species. Although there is clinical and epidemiological evidence to support tick transmission of B. vinsonii subspecies berkhoffii to dogs and coyotes, the mode of transmission of this Bartonella subsp. to cats and dogs has not been determined. Recent evidence supports tick transmission of B. henselae by Ixodes scapularis and Ixodes ricinus. Considering the diversity of Bartonella species and subspecies, the large number of reservoir hosts and the spectrum of arthropod vectors, the clinical and diagnostic challenges posed by Bartonella transmission in nature may be much more complex than is currently appreciated in human and veterinary medicine. In the natural reservoir host, such as a cat or rodent, chronic bacteremia with a Bartonella species can frequently be detected by blood cultre or PCR in outwardly healthy individuals. 1-3 In contrast, the diagnostic detection of a Bartonella spp. in a non-reservoir adapted host, such as a dog, horse or human patient, can be extremely difficult. Most, although not all diseases caused by Bartonella spp. occur in accidental hosts and these organisms are being increasingly implicated as a cause of zoonotic infections. 4-8 It is important to recognize that strains of a Bartonella sp. vary in their virulence. Therefore, highly pathogenic strains of B. henselae, for which the cat is the primary reservoir, can induce granulomatous myocarditis in cats, presumably following flea transmission. Until recently, mechanisms that facilitate persistent Bartonella bacteremia in mammals were not well understood. Recent reports have identified an intra-endothelial, as well as intra-erythrocytic localization for these bacteria, which represents a unique strategy for bacterial persistence. Non-hemolytic intracellular colonization of erythrocytes in conjunction with the ability to invade and replicate within endothelial cells would preserve the organisms for efficient vector transmission, protect Bartonella from the host immune response, and potentially contribute to decreased antimicrobial efficacy. Although the clinical implications are not understood, other in vitro studies indicate that Bartonella spp. can infect dendritic cells, microglial cells, monocytes and CD34+ bone marrow progenitor cells. Historically, atypical manifestations of CSD have included tonsillitis, encephalitis, cerebral arteritis, transverse myelitis, granulomatous hepatitis and/or splenitis, osteolysis, pneumonia, pleural effusion, and thrombocytopenic purpura. With the advent of specific diagnostic techniques, (culture, serology, and PCR), there has been a dramatic increase in reports describing human patients with “atypical” manifestations of CSD. Osteomyelitis, granulomatous hepatitis and granulomatous splenitis have been increasingly recognized in children infected with B. henselae, who frequently lack the classical lymphadenopathy of CSD. Previously, Bartonella infection would not have been considered a likely differential diagnosis by the physician in patients lacking a history of lymphadenopathy or animal contact. As evidenced by reports in the past four years, the spectrum of human disease associated with the genus Bartonella continues to expand, requiring periodic reassessment as new information becomes available. On a comparative medical (“One Health”) basis, our research group has documented many of the same CSD atypical manifestations in cats or dogs, including encephalitis, transverse myelitis, granulomatous hepatitis, osteolysis, pleural effusion, and thrombocytopenic purpura. In this context, a highly prevalent, naturally-occurring human disease (CSD) can be used as a “model” to determine the potential behavior of these bacteria in companion animal patients. Because cat scratch disease generally denotes a self-limiting illness characterized by fever and lymphadenopathy and because the recognized spectrum of human disease manifestations associated with Bartonella infections (which may not include fever or lymphadenopathy) has expanded considerably in recent years, it is becoming obvious that the designation CSD lacks clinical, microbiologic and zoonotic utility. Although cats are a major reservoir for B. henselae, B. clarridgeiae, and B. koehlerae, some patients deny the possibility of a cat scratch or bite wound, or indicate no contact with cats. Transmission from environmental sources, various arthropod vectors, perinatally or by other animal hosts is probable and the more inclusive term bartonellosis may facilitate enhanced future understanding of diseases caused by members of the genus Bartonella. As physicians have been taught that CSD is self-limiting, there is an ongoing lack of appreciation that B. henselae can cause chronic, asymptomatic or intermittently symptomatic illness, accompanied by persistent bacteremia in people. In this context, the documentation of chronic, relapsing bacteremia in cats, dogs and other animal species provides a “model” for better understanding human bartonellosis. and people with endocarditis. 3 It is important for physicians and veterinarians to recognize that some of these Bartonella species are found in the blood of cats, dogs, rats, ground squirrels, and rabbits. Because conventional microbiological techniques lack sensitivity, bartonellosis is usually diagnosed by PCR amplification of organism specific DNA sequences and/or through serological testing. Recently, the development of a more sensitive isolation approach, using BAPGM (Bartonella alpha Proteobacteria growth medium) followed by PCR has greatly facilitated the molecular detection or isolation of Bartonella species from the blood of sick or healthy animals, including cats, dogs, horses and human beings. Most importantly, the use of this enrichment growth medium prior to PCR testing has allowed our research group to confirm that immunocompetent human patients, in particular veterinarians and veterinary technicians, can have chronic intravascular infections with Bartonella spp. 4-5 Information relative to this EnrichmentPCRTM testing platform for animal and human patients is available at www.galaxydx.com. It is increasingly clear that no single diagnostic strategy will confirm infection with a Bartonella sp. in the immunocompetent patient population. As described in studies from our NCSU laboratory, B. henselae, B. koehlerae and B. vinsonii subsp berkhoffii seroreactivity was found in only 58.6% of the patients in which Bartonella spp. infection was confirmed by EnrichmentPCR TM and sequencing. Therefore, Bartonella serology lacks sensitivity and can only be used to implicate prior exposure to a Bartonella sp. Even when serum from cat scratch disease patients, which is caused by B. henselae, is used in various diagnostic laboratories for IFA testing, test sensitivities have ranged from 14 to 100%. induced the bite wound was captured and was also shown to be B. quintana bacteremic. In a cumulative study involving 392 patients with occupational animal contact or extensive arthropod exposure 31.9% were bacteremic with one or more Bartonella spp., when blood, serum and BAPGM enrichment culture PCR results were combined. Although this high prevalence of bacteremia is biased by testing at risk, sick individuals, it clearly demonstrates that intravascular infection with Bartonella sp. is much more common in immunocompetent patients, than was previously suspected. By IFA testing, only 75 out of 128 (58.6%) PCR positive patients were seroreactive to a panel consisting of five Bartonella sp. test antigens. In a recent study, Bartonella vinsonii subsp. berkhoffii, Bartonella henselae or DNA of both organisms were amplified and sequenced from blood, BAPGM enrichment blood cultures or autopsy tissues from four family members. 7 Historical and microbiological results derived from this family support human perinatal transmission of Bartonella species. To date, there have been a limited number of studies that address the potential impact of intravascular infection with a Bartonella sp. on reproductive performance, however, studies involving experimentally-infected cats, rodents and naturally-infected cows with various Bartonella sp. have identified decreased reproductive performance involving both males and females. The parents of these children had attempted to conceive children for several years prior to resorting to in vitro fertilization. We have also described a veterinarian, who experienced a needle stick while obtaining a fine needle aspiration sample from a cutaneous histiocytic neoplasm. 8 Subsequently symptoms, including headaches, fatigue and intermittent paresthesias (numbness) developed. This patient seroconverted to B. vinsonii subsp. berkhoffii genotypes I and III and B. vinsonii subsp. berkhoffii genotype I DNA was amplified and sequenced from sequentially obtained blood samples, whereas genotype III DNA was amplified from the cytological specimen. All symptoms resolved following antibiotic treatment. a liver biopsy from a patient with epithelioid hemangioendothelioma (soft tissue tumor considered a vascular cancer), after which the organism was isolated by BAPGM blood culture. 9 The unique capability of Bartonella to invade and induce long lasting intraerythrocytic and intraendothelial infections, in conjunction with the ability of at least three Bartonella spp. (Bh, Bq, and B. bacilliformi) to induce VEGF-mediated vasoproliferative disease in immunocompromised or immunocompetent individuals suggests that these novel emerging bacterial pathogens might contribute to the development of vascular tumors. 1 Chomel BB, et al. Vet Res 2009;40:29. 2 Breitschwerdt EB, et al. J Vet Emerg Crit Care 2010; 20:8. 3 Chomel BB, et al. Ann N Y Acad Sci 2009;1166:120. 4 Breitschwerdt EB, et al. J Clin Microbiol 2008;46:2856. 5 Breitschwerdt EB, et al. Parasit Vectors 2010;3:29. 6 Breitschwerdt EB, et al. J Clin Microbiol 2007;45:270. 7 Breitschwerdt EB, et al. J Clin Microbiol 2010;48:2289. 8 Oliveira AM et al. J Vet Intern Med 2010;24:1229. 9 Breitschwerdt EB, et al. J Clin Microbio 2009;47:1957. 10 Breitschwerdt EB, et al. Parasit Vectors 2010;3:76. 11 Sykes JE, et al. J Clin Microbiol 2010;48:3782. Without secondary disease, however, dogs usually exhibit no or only few symptoms and tend to have a high natural resistance to low levels of the bacteria. 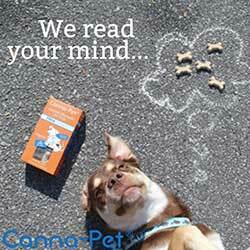 As a result, little attention has been paid to dogs in scientific study. Nevertheless, there are theories that canines may act as interim hosts and a further source of infections. Like hunters, dogs can come into direct contact with infected animals (e.g. when retrieving the game). The prevalence of infections among these animals is therefore an important question to be answered. Scientists from the Research Institute of Wildlife Ecology at Vetmeduni Vienna for the first time investigated blood samples from 80 Austrian hunting dogs from rural areas known to be endemic for tularemia. “After two independent analyses, five dogs clearly tested positive,” says first author Annika Posautz. The study thus showed that dogs in those areas of Austria in which rabbit fever is endemic, i.e. in which it regularly occurs, show a more frequent rate of infection. “The frequency of about seven percent shows that hunting dogs can also become infected regularly. As vectors of the disease, even without symptoms, the animals must also be considered unexpected carriers,” Posautz adds. Clear scientific evidence is still missing, however, the researchers say. 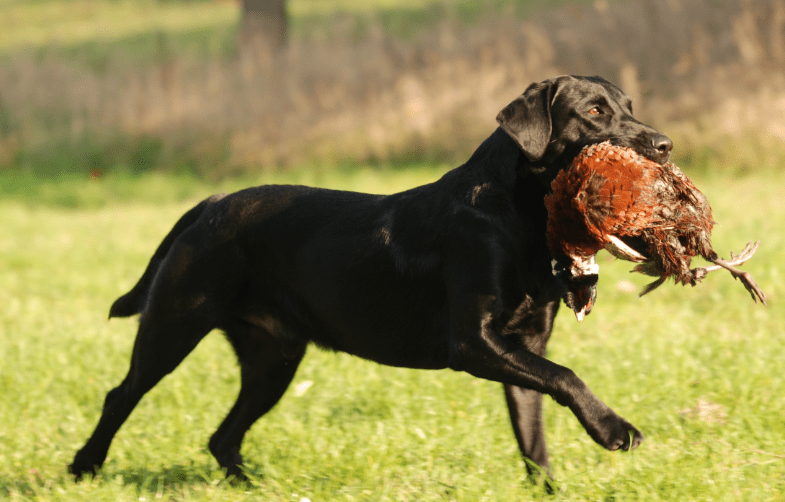 Other factors, such as age – young dogs could come into more frequent contact with game for training purposes – or the question whether dogs represent a potential source of infection for people, must be addressed in future studies. The blood samples were tested using two different agglutination tests to detect antigens on the surface of the bacteria or antibodies produced by the immune system. “Agglutination works by specifically clumping these proteins to make them visible under the microscope. In the case of suspected tularemia, more than one of these tests is necessary due to the possibility of cross-reactivity with other pathogens. If all tests are positive, the disease can be confirmed without a doubt. This was the case with five animals,” the researcher says. I purposely left the “related” section at the bottom as a clear reminder that Tularemia has been bioweaponized. This isn’t theoretical, it’s fact. Tularemia, brucella, certain Rickettsia’s, numerous viruses, some chlamydia’s, and of course mycoplasma have all been weaponized. For a lengthy but informative read on the Lyme-Biowarfare connections: CitizensAlert_Bob13 (Scroll to page 44 to see an executive summary. Please notice the names of Steere, Barbour, Shapiro, Klempner, and Wormser, the first four are affiliated with the CDC Epidemic Intelligence Service (EIS). Wormser, lead author of the fraudulent Lyme treatment guidelines, lectures as an expert on biowarefare agents and treatments). Everyone keeps yammering about climate change despite the fact ticks are extremely ecoadaptive but nobody is talking about ticks tweaked in a lab with bioweaponized pathogens. Dr. Daniel Cameron, a leading Lyme disease expert, discusses where are the ticks and what are the diseases they carry. The word is finally getting out. TICKS ARE EVERYWHERE! Recently some articles have come out on Heart issues with Tick Borne Disease (TBD). Most talk about Lyme; however, as you will see – there are many other players. http://davidjernigan.blogspot.com/2015/05/functional-heart-problems-and-lyme.html The Hansa Center in their blog states that a common symptom of chronic Lyme is Postural Orthostatic Tachycardia Syndrome or POTS. POTS can cause headaches, lightheadedness, heart palpitations, fatigue, shaking, fainting, cold or pain in extremities, chest pain, shortness of breath, and even nausea. Evidently, POTS can be caused by Lyme Endocarditis. For an excellent read on Lyme Carditis, please see: https://www.bayarealyme.org/blog/lyme-carditis-why-early-diagnosis-is-critical/ In a nutshell, it’s inflammation caused by an infection such as Lyme, viruses, and other pathogens. This inflammation messes up electrical signal conduction and can cause AV block, a serious oxygen depriving condition, hence all the symptoms listed above. Lyme Carditis is the more general term but it can be in any part of the heart: myocardium, pericardium, endocardium, cardiac muscle, valves, and aorta. The good news is it can usually be reversed with appropriate treatment. Sometimes a pacemaker is also needed. The article states about 4-10% of people with TBD develop this. Forrester states Lyme Carditis is “rare,” but even 4-10% of patients is a chunk of people. PEOPLE HAVE DIED FROM THIS and even the CDC reported 3 cases of sudden cardiac death between Nov 2012 & July 2013 among patients with unrecognized Lyme carditis. If one person died from Zika there would be a media blitz. https://www.ctvnews.ca/health/rare-but-serious-complication-of-lyme-disease-can-attack-the-heart-doctor-1.3952476 Recently a heart specialist in Ontario is warning doctors to be on the look out for Lyme carditis. Dr. Baranchuk points out that numerous people with heart symptoms were admitted to the ER two to three times before anyone considered Lyme carditis. He also states many don’t get the bullseye rash or notice vague symptoms of fever and muscle aches. Baranchuk wrote a paper http://www.cmaj.ca/content/190/20/E622 advising doctors to treat young patients with strange heart problems with antibiotics while waiting for results of Lyme blood tests. He states: “These patients may not require pacemakers to be implanted. They can be treated with IV antibiotics for 10 to 12 days and the electricity of the heart will recover completely forever,” he said. QUIT SAYING THE WORD RARE IN YOUR REPORTING ON TBD. But Lyme (Bb) isn’t the only culprit. https://www.ncbi.nlm.nih.gov/pmc/articles/PMC6010976/ Five cases of infective endocarditis associated with Bartonella henselae. https://www.ncbi.nlm.nih.gov/pubmed/9196420 Two cases of Bartonella Carditis. https://www.ncbi.nlm.nih.gov/pubmed/8849149 22 cases – 13 that had undetermined Bartonella species. All of this continues to demonstrate why Lyme Disease isn’t typically just Lyme Disease but MSIDS, multi systemic infectious disease syndrome, a literal menagerie of pathogens invading the human host making our cases extremely complex and difficult. https://madisonarealymesupportgroup.com/2018/04/04/correlation-of-natural-autoantibodies-heart-disease-related-antibacterial-antibodies-in-pericardial-fluid-mycoplasma-bb-chlamydia/ Mycoplasma pneumoniae antibody positive patients had significantly higher anti-CS IgM levels. In CABG patients we found a correlation between anti-CS IgG levels and Mycoplasma pneumoniae, Chlamydia pneumoniae and Borrelia burgdorferi antibody titers. Our results provide the first evidence that natural autoantibodies are present in the PF and they show significant correlation with certain antibacterial antibody titers in a disease specific manner. Hopefully by now it’s clear that carditis caused by TBD’s is not even close to rare. It should also be painfully clear that we are truly in the dark ages on this and that much work needs to be done – and quickly. Ending on a personal note, I had these bizarre heart symptoms early in my journey. To say they were frightening would be an understatement. I would wake in the middle of the night with my heart flopping like a fish out of water. It felt like an elephant was sitting on my chest and my biceps were often numb. I gasped for air as well. Upon my first dose of Mepron, Artemisinin, and an intracellular antibiotic, I felt as if I was having a heart attack. Thankfully we pulsed the artemisinin as that allowed the frightening herxes to dissipate some. Due to my response to these drugs my guess is Babesia was the culprit. https://madisonarealymesupportgroup.com/2016/01/16/babesia-treatment/ We treated Babesia for an entire year as it’s a notoriously persistent pathogen. It’s important to hit it hard and long as it’s been known to build resistance to drugs. There has been debate among some as to the effectiveness of Artemisinin and I do feel quality matters. I’m a huge fan of this kind: https://www.allergyresearchgroup.com/quality-artemisinin. And no, I’m not affiliated with them in any way. BTW: We used 500mg morning and night MWF. It makes your mouth taste metallic. Do not mess around with heart symptoms. Be a clanging gong until someone takes you seriously and feel free to copy this article and take it to your doctors. They need to be educated and We the People are up to bat.